Even after it was lopped off in 2009, Jean Nouvel's Tower Verre, aka the MoMA Tower, still remains one of New York City's tallest planned residential towers, sited adjacent to MoMA's headquarters on West 53rd Street. After fights with the neighbors, Nouvel's tower has been keeping a low profile, but Curbed (via NY YIMBY) has spotted a few new renderings of the tower at Adamson Associates Architects, the architects of record for the project. 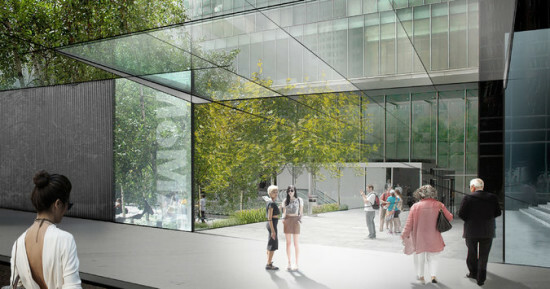 While the exterior changes are minor, fans of Tod Williams and Billie Tsien's now empty American Folk Art Museum can breathe a sigh of relief, for now, as the small, bronze-clad structure remains standing in the rendered views. 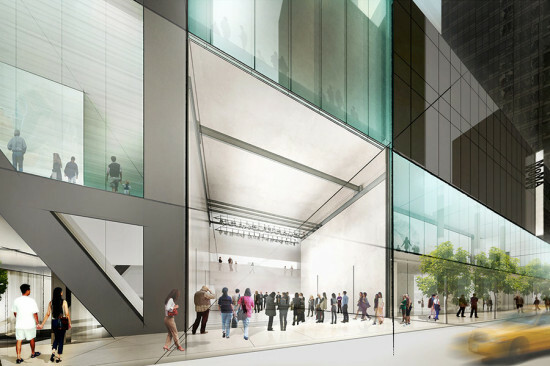 Also of interest are a couple new renderings of the building's interior spaces. 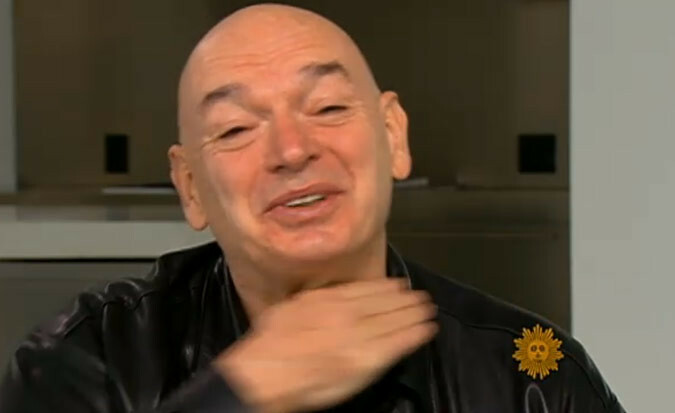 Jean Nouvel feels like his MoMA Tower has been put under the guillotine. The starchitect behind the lopped-off Midtown Manhattan proposal told CBS News this weekend that "It's very French to cut the head, eh?" His 75-story tower would have rivaled the Empire State Building for supremacy over the New York skyline, standing 1,250 feet tall, but met significant opposition from neighbors worried the tower would drown their street in shadow. City Planning Commission officials voted earlier this year to allow a shortened version of the tower - chopping off 200 feet of the Pritzker Prize winner's design. Nouvel's vision has been sent back to the drawing boards, but he says it's "not in his character" to feel discouraged. Be sure to check out AN's cameo appearance at the end of the interview. 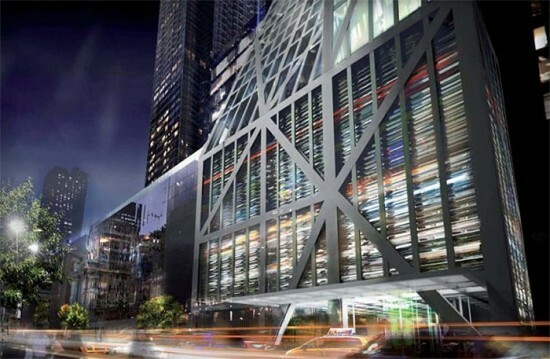 A group of Midtown residents and concerned citizens, many from the West 54th/55th Street Block Association, have been the leading opponents of Jean Nouvel's MoMA tower. They have been very vocal during hearings at Landmarks and, just a few weeks ago, City Planning Commission. Now, The Coalition for Responsible Midtown Development, as the group is calling itself, have launched a website, no2moma.com. There, they succinctly recast their previous opposition to the project--light & shadows, traffic & congestion, out-sized & ugly--as well as presenting a six minute documentary that makes the group's best case yet. Our favorite part is the clip above, where the Nouvel tower rises, Frankenstein-like, from "a lot no bigger than a McDonald's drive-thru." The full video is after the jump, but, given statements made by some commissioners during a meeting Monday, all this flash and frustration may be too little too late. At the very end of Monday's scheduled City Planning Commission meeting, the commissioners held an impromptu discussion of the project they were presented at the hearing two weeks ago. Impromptu because the full discussion, and likely the vote, will all come at the next scheduled meeting on the matter September 9. Still, the commissioners are clearly struck by this project, it's Pritzker Prize-winning architect, its heavyweight patron, its skyline-altering design. But as before, the discussion centered on the design and not its surrounding impact, which is the overwhelming concern of the tower's opposition. Asked by fellow commissioner Kenneth Knuckles how she would be voting on the project, chair Amanda Burden gamely demurred, saying she was withholding judgment until the actual vote. And yet at the same time, she seemed to be leaning strongly in favor of the project. "We're an optimistic city, we're a skyscraper city, so this project would not be out of place" Burden said. "It must be iconic, it must be distinguished. To get to that height in the sky, it's got to be great. I don't have a problem with the height. But let's see it, and see where it falls with the Chrysler Building and the Empire State Building and if it deserves it." Burden added, underscoring the commission's concern with preserving the building as designed over other issues, "It's very important how we memorialize and freeze critical design elements." This way, the commissioners believe, and the applicant, Hines, seems to agree, Nouvel's tower and nothing else would or even could be built there. It's a valid concern (see: Frank Gehry, Atlantic Yards), but for the building's neighbors nowhere near the top of the list. Perhaps the coalition should have brought this video with them last month, as it might have helped sway the commission in its favor. Then again, there's always the City Council, where Speaker Christine Quinn, in whose district the project lies, has yet to take a position. Perhaps she's more of a cinephile than Burden. The coalition had better hope so.